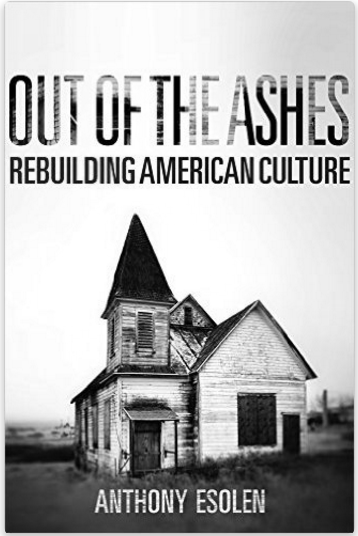 I want everybody to read Anthony Esolen’s Out of the Ashes. Buy it if you can; at least borrow it. Libraries still exist in many places, and some of them still have books. After you read it, follow its prescriptions. In a word, they are this: fight. This is a reactionary, and not conservative, formulary, and the medicine is delightful. Remember, nobody gets out of this alive. Restore truth-telling. Never use the language of your enemy. Two men cannot marry each other. Don’t say they are married. A man who pretends to be a woman is a man. Say he, and say he is a man. Once you lose contact with language, you lose your grip on reality. Esolen says we’re all happy with our liars, and only dislike the other guy’s liars. We expect our leaders to lie, and enjoy their lies when the untruths are in our service. Clear your mind of cant, says Esolen, and so say all the sages. Here is a quick and generally reliable rule to follow. If people have always said it, it is probably true; it is the distilled wisdom of the ages. If people have not always said it, but everybody is saying it now, it is probably a lie; it is the concentrated madness of the moment. Restore a sense of beauty. Art is purposely ugly and “transgressive” of the truth. It is foisted upon us. Resist it. If you see a piece of ugly or hateful art, say, “This is ugly.” Resist drabness, says Esolen. This includes your clothing. This includes your churches. I have seen crosses that look as if a modernist Jesus were flying with wings outspread, like a theological pterodactyl. This includes music. God save us from guitars and happy-clappy Jesus-is-your-buddy Disney-like-tunes. Do not participate in these horrors. Restore the school. Get rid of education—flush it away!—and restore teaching. All readers know what this means. Restore local control. Restore parental control. Parents are parents, not teachers, not social workers, not bureaucrats, not government. This will mean homeschooling for most, with all the sacrifice that that entails. But you have to save your children from the deadening horrors of government-backed factories. Schools are dead, says Esolen. The proper relationship [between parent and teacher] is reversed. We see this reversal quite clearly whenever a parent, who ought to be considered the teacher’s employer, or the one who delegates his authority to the teacher under certain conditions that he and his fellow parents stipulate, attempts to register a complaint about some nonsense or perversion or even attempts to set foot on the school grounds without permission. Rebuilding the college. Esolen does not come to the view that colleges should be nuked from orbit, though that might be because he is unfamiliar with the effectiveness of these weapons. He tells the story of a professor who was fired because he dared tell this truth: “that the most important work that most women will do will be to raise their children well.” A crapstorm of elites pretending to be offended erupted. Do not donate any money to any school that has not remained faithful. Esolen tells of a program at a state school, the University of Kansas, which had students watch three professors in love with their material talk to each other. “The program was a tremendous success and soon attracted the envy and enmity of much of the faulty…many [students] converted to the faith and even even monasteries. Such a thing could not be permitted to continue.” So it wasn’t. Women are not men, and can never become men. Equality is another lie, perhaps the biggest lie. We must let boys be boys, and girls be girls. If you allow your boy to be drugged so that he acts more like a girl, home school. Home school anyway. Is it a coincidence that the most awful century followed on the heals on women’s “liberation”? If we are to take as evidence women’s political shows, a woman is loud, vulgar, screeching, ignorant of history, morbidly touchy, vindictive, smug, voluble in slogans, impervious to the principles of any coherent political philosophy, and ready to see the world as the she-bear sees it when her cubs are restless and the food is scarce. Making good things again Don’t buy crap, don’t read crap, don’t watch crap, don’t listen to crap. Don’t listen to fools and fibbers. So much for TV! “Maybe we draw near to the mark here if we simply confess that we do not have beautiful things because we do not want them enough.” Truth. The musicale is vanished. Restore it. Learn to play an instrument. Play cards. Play 10,000. Be families. “Part of our problem is that those twelve years of schooling are in large part an enormous waste of time, because very little of the true, the good, and the beautiful is learned there.” Why? Most of it is illegal now. Esolen has a nice description of rent seeking, and how it is destroying the last vestiges of the Republic. Large corporations, like Apple and Google, work with Congress and the bureaucracy to write the laws and regulations—and choke the life out of us. We used to head into the woods and play war, shooting each other with BB and pellet guns. Or hunt. Or sled. Or play football. Or just play. Get the damned “devices” out of kids’ hands. There is more: much, much more. I have done a lousy job summarizing it. Get the book and read it and follow it. Amen. Anthony Esolen, himself a victim academic Liberal secular idiocy, has put his fingers squarely on the key aspects of the cancerous cultural decay that is destroying our country and the Western world. It is a world that has neglected God, worshiped Man and is presently devolving little by little into a hell on earth as we see before our eyes. Are there positive signs? How about Brexit and the Trump election which is about the realization of the failures of the current system. And how about the fact that a number of good thinkers like Anthony are waking up to the problems and offering solutions. And lastly how long can this devastation go on before we have open rebellion. And who might be the biggest culprit in our cultural collapse? For me, it has to be the Catholic Church since Vatican II which has basically been a proponent of all this Liberal nonsense instead of resisting and offering an alternative in education and culture that celebrated the abiding truths and beauty of God and man. I admire Tony Esolen although think he sometimes goes overboard on his “prescriptions.” But in general, I think he is right on all points. You might disagree on this or that, if you think “thinks where I am are not that bad” — but that doesn’t mean that you are right or, if that you ARE right about school, or music, or play, etc., where you are, that things where other people are aren’t much worse than you know. I think a lot of people are in for a rude awakening, and very soon, about a lot of things. There was a poster once “Everything I need to know I learned in Kindergarten”. It was ripped off and turned into inane posters by the progressives and feminists on all kinds of useless topics, but if you can find the original, it was very accurate. From the looks of things now, no one is learning a thing in kindergarten or thereafter. I predict Anthony will be vocationally martyred, one day be canonized, and eventually will be named chief intercessor for academics about to be fired for not towing the company line. I also predict Providence will never recover its Catholic identity, and I say good riddance. By the way, the KU program alluded to was the Integrated Humanities Program mainly led by John Senior. Abp. Coakley and Abbot Anderson of Clear Creek are two distinguished alumni, inter alios. Esolen’s book “The Politically Incorrect Guide to Western Civilization” is also well worth reading. It is definitely not some higher calibre of conservative pundit talk; it is instead a very good course on Western civilization. Alas, I don’t think some of the damage from the 1900s will ever be healed. But a lot of people came out of it very well-heeled…..
Next Next post: Could You Do Progressivism, But From The Right?